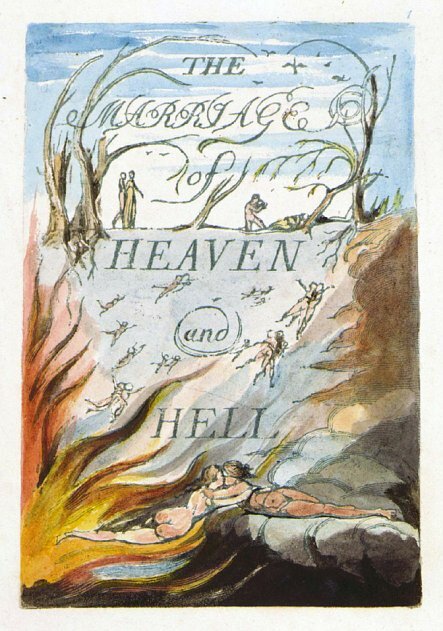 William Blake’s The Marriage of Heaven and Hell is a work to delight both the poet and the freethinker. It is a short book that combines language and art, serious ideas and comedy. The latter is an introduction to a long work titled “Milton” though the Milton who appears in this tale is not the actual writer. “Milton” is forty five pages of tiny script and complex images, telling an equally complex story. “The Marriage of Heaven and Hell” is shorter, easier to follow, and fascinating for both the ideas and the language. Blake constructed these books by etching copper plates, printing and then hand coloring each page. “The Marriage of Heaven and Hell” consists of 27 such pages. There are nine copies in existence; fortunately reproductions can be found in quite a variety of editions, some very inexpensive. These editions usually print out the text as well, for those spots where Blake’s script is difficult to interpret. Blake was a Nonconformist, which means that he was not a member of the Church of England. He did not fully align with the other nonconformist traditions either. His little book is partly a tirade against priests, of all times and places, and partly a celebration of creative energies. From these contraries spring what the religious call Good and Evil. Good is the passive that obeys Reason. Evil is the active springing from Energy. Good is Heaven. Evil is Hell. The reason Milton wrote in fetters when he wrote of Angels & God, and at liberty when of Devils & Hell is because he was a true Poet and of the Devil’s party without knowing it. These proverbs, which send the mind going in many different ways are followed by three sections entitled “A Memorable Fancy” in which angels and devils and giants all appear and further commentary against such errors are trying to separate body and soul, or make peace between two classes of humans he calls the Prolific and the Devouring. By the first he means the creators. The second are those who only consume because they cannot create. I have only picked out samples from the book. To get the sense of the whole, you will need to go read it yourself. After reading a copy from the library, I bought my own copy from Powell’s for $5.00. this is wonderful and i love Blake!